Fifty years after Cesar Chavez and the United Farm Workers created the nation’s first medical plan for farm workers named after the New York senator who was slain the previous June, the Robert F. Kennedy Medical Plan has paid out $350 million in medical, dental and vision benefits to farm workers and their families protected by union contracts. Its 50th anniversary was celebrated on Saturday in San Jose, featuring Kerry Kennedy, RFK’s daughter and president of the international human rights organization continuing her father’s work, plus farm workers whose accounts of how the health plan has significantly changed their lives deeply moved Kennedy. The UFW Foundation sponsored the event that included Kennedy, president of Robert F. Kennedy Human Rights; 30 farm workers from regional unionized companies; UFW President Arturo S. Rodriguez and union secretary-Treasurer and President-elect Teresa Romero; farm labor and civil rights icon Dolores Huerta; Paul F. Chavez, Chavez’s son and president of the Cesar Chavez Foundation; UFW Foundation Executive Director Diana Tellefson Torres; Shah Kazemi, owner of Monterey Mushrooms and a RFK plan trustee; current and former RFK plan staff; and community and political leaders. It is hosted at historic McDonnell Hall adjacent to Our Lady of Guadalupe Catholic Church named for Father Donald McDonnell who as his parish priest introduced a young Cesar Chavez to activism in the early 1950s. Down the street from the church on Scharff Ave. in the former Sal Si Puedes (Get Out If You Can) barrio is where Chavez began his community-organizing career in 1952, which led a decade later to founding of the UFW. When Senator Kennedy campaigned for president in San Jose in late March 1968, he attended mass at Guadalupe Church. After the program and a lunch reception, Kerry Kennedy was deeply moved during a private session with the farm workers who related what their medical plan named for her father has meant to themselves and their families. 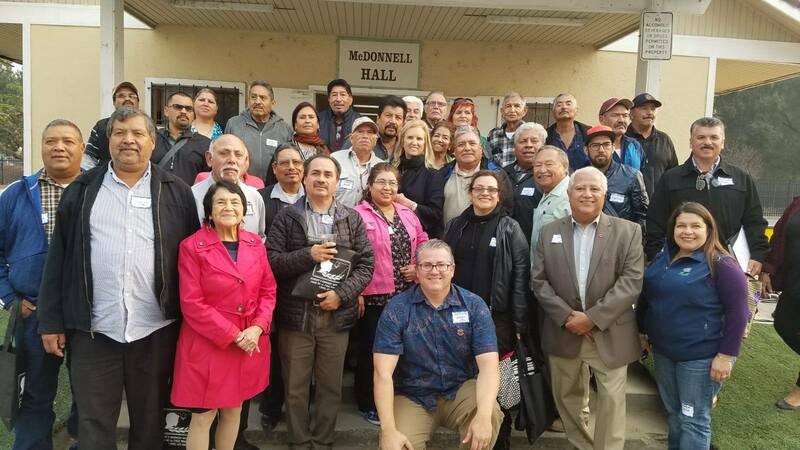 Photo of Kerry Kennedy (center) with some of the attending farm workers who receive RFK medical plan benefits as well as (front row left) civil rights icon Dolores Huerta, UFW National Vice President Armando Elenes (kneeling), UFW President Arturo Rodriguez and Cesar Chavez Foundation President Paul Chavez.